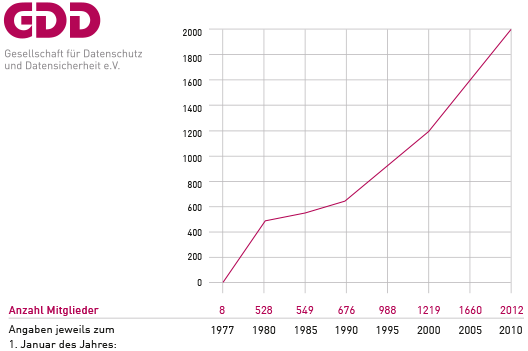 Being the largest association of its kind in Germany, the GDD currently has more than 2.000 members. The amount of members is constantly growing which shows the value of privacy and data protection in companies and in general. Among the company members there is a broad variety of businesses. There are large corporations as well as smaller companies. Especially for larger companies data protection has become an important issue, not only because they want to avoid penalty notices from the supervisory authorities, but also because they need to avoid adverse public relations for non-compliance with data protection provisions. Experience shows that success of electronic commerce depends on consumer confidence. Nowadays, protecting customers` privacy has become a significant “quality factor“ and even a competitive advantage. Data protection provisions apply to the public sector as well. Also “public bodies“ may benefit from membership. The DPO was installed with Germany`s 1977 Federal Data Protection Act (BDSG). According to German law, companies which process personal data automatically and regularly employ ten persons for this purpose have to appoint a DPO. The underlying rationale is self-regulation and avoidance of unnecessary bureaucracy. Once companies have installed a DPO as an internal compliance institution, data protection authorities have to intervene only when a breach is suggested. The past 30 years have proven the principle of corporate data protection to be useful in guaranteeing both effective data protection and reasonable economic freedom. Furthermore, all federal authorities and more and more public bodies of the states (Länder) have to appoint a DPO. The DPO works towards ensuring compliance with the BDSG-Act and other data protection provisions. Given his responsibilities, he needs to have certain qualifications. The GDD helps to develop and maintain the necessary know-how. Private members may have other than professional interests in data protection.